The World Motocross GPs are back this weekend, and we received a comprehensive press release from the series outlining the main storylines for the weekend. If you haven't followed the GP scene during the off-season, just read below and you'll be an expert. It is official, the new season is upon us and the gates are all set to drop this weekend at the circuit of Losail, Qatar. After the success of last year, the FIM Motocross World Championship has returned to the Middle East to host the opening round of the 2014 FIM Motocross World Championship. And just like last year, the racing will take place in spectacular fashion on Saturday March 1st in the evening under floodlights. The track of Losail is man-made and situated along side the MotoGP circuit in Losail (Qatar). Thanks to its extraordinary location, everyone involved this weekend has access to the absolutely impeccable facilities that coexist with the MotoGP circuit. This means flawless offices, media centres, toilets and showers as well as indoor concrete pit areas and a restaurant. Reflecting on last year, the lighting systems have been dramatically improved, allowing both riders and spectators more visibility. 32 lighting poles, 420 lights with 2000W power each supplied by 10 Generators – 350 kva - resulting in better lighting overall which in turn will not only improve visibility for participants but also enhance the picture broadcasted via Internet or television. In other news, the races have been shortened by five minutes, thus making both MX2 and MXGP racing thirty minutes plus two laps and the FIM Women’s Motocross World Championship will be making their return to the paddock of MXGP. 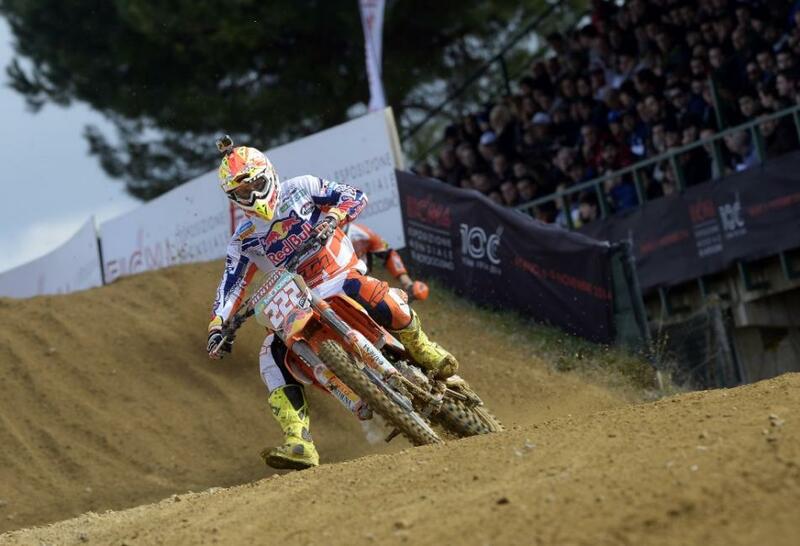 This year, the defending FIM Motocross World Champion Antonio Cairoli is the man to beat. Currently sitting second place on the ‘All-Time Wins’ list (38 behind Stefan Everts) the likeable Red Bull KTM Factory Racing rider will be aiming for his eighth FIM Motocross World Title. Earlier this year, Cairoli absolutely dominated the first two rounds of the Italian Championship proving he is fully refreshed and ready to take on the year. The only thing that could slow the insanely talented Italian down, ever so slightly, is the ankle injury he is carrying after colliding with another rider in the start at the third round of the Italian Championship two weeks ago. As for those looking to stop Cairoli, Rockstar Energy Suzuki World’s Clement Desalle is a likely candidate. Desalle has made himself a podium name since his first GP win back in 2009 and has since finished in the top three overall for the last four years. With already two seconds and two third place rankings, Desalle has only one box left un-ticked and is already looking fierce after winning the ‘Masters Motocross International’ pre-season race last weekend in Lacapelle-Marival, France. Fellow Rockstar Energy Suzuki World rider Kevin Strijbos improved immensely throughout 2013, finishing more often than not on the podium in the closing stages of the season. Although the winter period saw him side-lined with a broken hip, the Belgian Suzuki rider returned to racing last weekend in Lacapelle-Marival (France), where he showed amazing speed winning the first race ahead of Desalle. Monster Energy Kawasaki Racing Team’s Gautier Paulin took home seven podium finishes in the early stages of last season, three of which were Grand Prix wins. After a spectacular win in Maggiora (Italy), Paulin went on to win a few more races but his progress in the championship was hindered as he battled to keep his Kawasaki 450 on two wheels. Since then, it seems the Frenchman has re-grouped, making his first appearance of 2014 two weeks ago at the third and final round of the Italian Championship in Montevarchi (Italy) where he won both motos. Crowned Italian champion two-weeks ago in the popular star-studded Internazionali d'Italia, Yamaha Factory Racing’s Jeremy Van Horebeek could be the surprise of the season. With his first season in the MXGP class already under his belt, Van Horebeek is oozing confidence and is fit and ready to show the world what he’s got. Another rider onto his second season in MXGP is CLS Kawasaki Monster Energy’s Tommy Searle. Searle was named as the most promising rookie last year and is yet to live up to that promise. Now, with one season of MXGP class racing on the shelf, 2014 could be the year to turn his top tens into top threes. Red Bull KTM Factory Racing’s Ken De Dycker finished third overall last year and would have normally been another championship threat. Unfortunately, the tall Belgian will be missing in action for the opening rounds after an off-season crash put him in out with a severely broken wrist. Team HRC’s Evgeny Bobryshev and Max Nagl are no strangers to the MXGP podium. Both riders have proved in the past they’ve got the goods to go the distance and given they are both 100% fit and healthy, they could be genuine title threats. After two seasons riddled with injury, Monster Energy Kawasaki Racing Team’s Steven Frossard is all set to make a comeback. The Frenchman has already made a couple of pre-season appearances in Montevarchi (Italy) and Lacapelle-Marival (France) confirming he can still run the pace of the top riders in MXGP. Last but not least, the 2008 FIM MX2 World Champion Tyla Rattray has made a return to Europe after spending the last five years racing in the United States. Rattray has a factory ride with Red Bull IceOne Husqvarna Factory Racing and has admitted he’s more than ready for the challenge. The question of the season remains “Can anyone challenge Jeffrey Herlings?” The Red Bull KTM rider will not only be racing for his third consecutive FIM MX2 World Title, but also the “perfect season.” The nineteen-year-old Dutch sensation has not been shy in admitting he wants to be the first rider ever in the history of FIM Motocross World Championships to win every race and every round, and given his recent display of speed at the ‘Hawkstone International’ where he dominated not only the MX2 but the superfinal (MXGP and MX2 combined) as well, he could be well on the way. 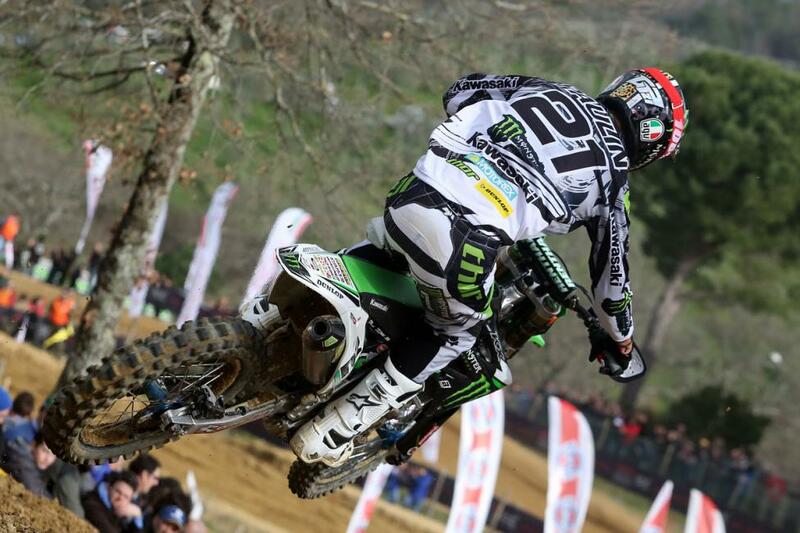 The 2013 FIM MX2 World Championship runner-up Jordi Tixier has showed some great speed in the past. The young Frenchman has been chipping away at his teammate (Herlings) and hopes to challenge him this year. Thanks to his consistent results, and off and on moments of brilliance, KTM Silver Action’s Jose Butron finished the 2012 season in third overall. Butron’s highlight was being the only rider to beat Herlings in a race last year. With that confidence, Butron could be the one to turn up the heat in MX2. Big things have been expected of CLS Kawasaki Monster Energy’s Arnaud Tonus in the past, but unfortunately a series of freak accidents have kept him off the gate. This season, the Swiss star is back in action and has already proven to still have blistering speed, winning the pre-season MX2 in the Italian Championship. After winning the Grand Prix of Britain last year, Rockstar Energy Suzuki Europe’s Glenn Coldenhoff has definitely proved he’s got the potential to be a podium guy. On a good day, CLS Kawasaki Monster Energy’s Dylan Ferrandis could be the one to challenge the champion Jeffrey Herlings. After proving he can run the pace on hard pack and proving he was the second best sand rider last year at the Grand Prix of The Netherlands, Ferrandis could be one to keep an eye on this year. Yamaha Factory Racing’s Christophe Charlier and CLS Kawasaki Monster Energy’s Alessandro Lupino are two riders who have shown a lot of promise in the past. Both are capable of standing on the podium and will be motivated by the fact it is their last year in MX2. Young guns like Russian Aleksandr Tonkov and Frenchman Romain Febvre both made lasting impressions last year. Due to their speed and raw talent, the duo was picked up by Wilvo Nestaan Husqvarna Factory Racing and will be racing on some of the best material, looking to make their mark this year. One rider who could be a surprise challenger this season is last year’s European EMX250 Champion Valentin Guillod. Guillod put in a great performance last year, dominating the EMX250 championship and then blowing everyone away when he battled up front on a KTM 450 at the Monster Energy FIM Motocross of Nations. This year Guillod will ride for Standing Construct KTM, the same team that took Glenn Coldenhoff to his first GP victory in 2013. The FIM Women’s Motocross World Championship has made a return to the paddock of MXGP. After a two-year hiatus, the numbers and depth of women’s racing had noticeably shrunk, but now all of that is in the past as the women are back and so are the numbers. Reigning FIM WMX World Champion Chiara Fontanesi could have her hands full this season. The two-time FIM WMX World Champion somewhat dominated the last two years and it will be interesting to see how the talented Italian wonder lady handles the pressure from old rivals. Team One One Four’s Livia Lancelot is the only female to have ridden already at the circuit of Qatar. Last year Lancelot lined up in MX2 and stunned the nation at how a female could actually ride a motorcycle that well. Although she didn’t qualify in the men due to the insane speed of Jeffrey Herlings and the 110% qualifying rule, this lady will be definitely in her element this weekend and is sure to be a title contender this year. Last year’s WMX runner-up Meghan Rutledge is looking to go one better this year. The nineteen-year-old Australian has signed up for the entire season thanks to the support of Bud Racing Kawasaki and will be looking for nothing less than WMX glory. HM Plant KTM UK’s Natalie Kane had a dramatic end to last season when she missed the first race of the last round due to the need for medical clearance. Upon returning to the track, Kane lined up for the second race and blitzed the competition to end her season on a bittersweet note. After narrowly missing out on second overall in 2013, Kane will be back this year with a vengeance. The four-time WMX Champion Steffi Laier will be back this year and ready to challenge for her fifth WMX championship. The German speedster will be lining up with support from her new team Dragon Moto Suzuki. Another blast from the past is Twenty Suspension Suzuki’s Larissa Papenmeier-Picoto. Papenmeier-Picoto has won her fair share of WMX Grand Prix’s in the past and will be back as an interesting edition to the 2014 line-up.